It’s not often that we see a big game where neither side is really on top of their game. Arsenal have started the season grinding out a few results on the basis of hard work, mentality, and the likes, qualities that should never be the primary strengths of a team. Wenger doesn’t know his best starting eleven at the moment as he tries to find a place for Jack. The Gunners have been ponderous in possession, ineffective in front of goal, and error prone at the back. The win against City in the Charity Shield game has been the high point of the new season. Pellegrini’s side never came close to their best in that game and have gone through the opening fixtures without quite finding their top gear. The win against Liverpool in the title race six-pointer was useful in terms of points and showcased glimpses of their quality. There were enough moments though, when you could see their defence barely hanging on. And the most prolific attack from last season doesn’t look quite as menacing at the moment. Pellegrini hasn’t tweaked the system around in any noteworthy manner. Their current problems are mainly down to individual form, injuries, and player availability. Yaya Toure, irrespective of the reason one may want to ascribe, just doesn’t seem like the beast that he was last season. Aguero is just coming back to full fitness and was rendered ineffective by a deep-lying Stoke defence. With Jovetic and Fernando injured, Negredo sold, and three big games within a week, the Chilean will have a tough task rotating his squad while maintaining the balance between attack and defence. Both teams would be justified in thinking this game is there for the taking. On the other hand, neither would want to lose and thus could focus on keeping things tight. The games between these sides at the Emirates in the last few years have tended to be of the latter type. Only 5 goals have been scored in the last five meetings between the clubs at Arsenal’s new stadium. Three of those battles ended in a stalemate. Since both sides are primarily attack minded and possess excellent offensive potential, the battle for midfield control will be very important. It’ll be vital to minimize the number of times the attacking players can run at the defensive line or play in the spaces between the lines. Slowing down transitions by applying pressure at the point of loss of possession, low-risk passing in the centre of the pitch, and carefully controlled spacing between the players will help protect the goal, and help the high defensive lines get back into more secure deeper positions before they are called into action. Debuchy’s aggressive positioning and Mertesacker’s lack of speed will give the visitors some opportunities to build attacks down Arsenal’s right. It’s hard to imagine space won’t exist so the next best option is to limit passing into and from that space. If Kolarov and Demichelis start, Arsenal should also have some interesting attacking opportunities on that flank. Silva won’t track Debuchy consistently either. City usually make up for that by limiting quick passing options. I recommend keeping an eye on how often spaces appear on that flank and the frequency with which either team is able to exploit them purposefully. Welbeck’s pace and movement should also pose a tough challenge to the City defence if they try to stay high up the pitch. It’ll be interesting to see if Pellegrini sticks to his two-striker approach. City are visiting Bayern in midweek and have another Premier League six-pointer against Chelsea next weekend. Will he risk both Aguero and Dzeko given the paucity (!) of alternatives. It’d be a bold move, and would also show great trust in his midfield and system of play as they’ll be a man short. Does the Chilean trust his tactics and the players’ ability to sustain a tempo to such a degree that he’d risk exposing his defence. It’s a gamble worth taking based on Arsenal’s current form in my opinion. Moving Sanchez to the left and bringing Wilshere in on the right is an interesting option as discussed before the previous game. I’m not sure Wenger is even considering that at the moment. There are a few other tweaks to the starting eleven available and the manager’s current favourite – Wilshere and Ramsey in the centre – add to the possibilities. Both teams have an opportunity to kick start their season, albeit belatedly. I find it hard to assess how teams will come out and perform this early in a new campaign, particularly after an international break. The one that can raise it’s level by a couple of notches should end the day on a happier note. Sure, he’s a quick player, and Hodgson was clearly quite gung-ho about pace, but the then United man has hardly offered anything beyond work rate on the flank throughout his career. There were better players for the central striker role and it was hard to see him fit in anywhere other than the bench. The youngster might have had more of an impact as a late sub if he’d played around the goal and the penalty box. That is not the same thing as saying Welbeck is not good enough or an outright bad player. He is very talented, just also somewhat limited. Just like Giroud, or Sanogo, or Chicharito, or Remy, or Bony, or most of the other forwards currently playing in the top leagues. I think he’s good enough to play in the Premier League but not sure if he’s good enough to lead the line for a team that wants to win it. At least not yet. The hard fact is that there are very few complete players, and the proportion is even smaller when it comes to strikers because it’s a very tough job demanding exceptional technique and timing along with other qualities. Most players have a unique mix of traits that makes them very useful in certain situations, while their weaknesses can make them look like absolute chumps in other instances. A lot of transfers fail because people are not able to assess how an individual’s qualities will improve or worsen once the context in which he is playing is changed. Welbeck has obviously not been a success at United despite being one of the hot prospects in his younger days. 2011-12 was a good season for him in terms of playing time and goals but Ferguson went ahead and bought Van Persie instead of relying on the home grown talent to develop and deliver. The difference was clear and decisive. The Dutchman won them the league. The Englishman would not have. I have some sympathy with Welbeck because his path has always been blocked by some genuinely top class players. And he didn’t get to play in his favoured position. I like the fact that he’s willing to move from his boyhood club in search of regular playing time. At Arsenal, particularly with Giroud injured, Danny should not face either of these problems. Welbeck does not have the decisive level needed to star in a central striking role for a team that wants to win the major trophies. Nevertheless, he has age on his side and the raw material is there. Some of his physical attributes like pace, height, and power are very useful. These are, however, secondary qualities. You will, for example, be able to find a lot of people who are as tall, and strong, and fast as Thierry Henry. Even when given the exact same training, most of those people will not become lethal strikers like the Frenchman. In that sense, this is a good test for both the player and his new manager. Can Wenger guide him to that elusive decisive level? Can the player build on his traits and use his hunger to hit heights he’s not even come close to before? Technique is harder to develop after a certain age. But he’s already way ahead of Sanogo on that front and should be able to do better by playing centrally on a consistent basis. It remains an area of improvement but there is hope. The biggest question is whether he can develop the game intelligence and instinct that the top strikers have. This is harder to learn and can be a very innate thing. He needs to go up a couple of notches to really get close to the best strikers around the world. Space is at a premium in and around the opposition goal. The best players have to be aware of where it exists at a given moment (changes all the time), need the ability to manoeuvre space (simple example is going to back post and then darting forward), must know where the goalposts are even when playing with back to goal or making horizontal/diagonal runs, should possess the ability to read the defender’s qualities and identify his weaknesses that they can exploit, and must make the right decisions on a consistent basis. Any guy scoring goals in the Premier League has these qualities to some degree. You can see Welbeck’s instincts from the runs he makes, the way he adapts his body shape to get shots off, the little dinks over the keeper, and so on. The very best have an extraordinary level of consistency and they can repeat the output against different types of teams and in varying conditions. These are players who can produce a decisive moment out of nothing. Can Wenger take Welbeck to a level where he is ready for all challenges? We’ll have to watch and find out. I understand if this article leaves you a little confused about my opinion of this deal. I don’t see this a great acquisition or as a panic buy. It seems like an opportunity arose and Wenger has taken it. There is no guarantee of success but the probability of meaningful short term impact and long term development into a top class player is high enough to take the associated risk. Wenger would most probably have preferred someone like Falcao or Reus, as would we. It’s natural to feel a little underwhelmed because of that. Just don’t get bogged down. There are very real and exciting possibilities based on how things work out. I think Welbeck will be a threat from a lot of those runs behind the defence, which Giroud rarely makes and Sanogo doesn’t capitalize on. He will also gel well with other speed merchants in the side. It’s not hard to imagine Walcott or Chamberlain bursting past the defence on the right with Danny taking up intelligent positions in front of goal. It could be a very fruitful attacking avenue for the Gunners if he can work on clever movement and develop on the odd unorthodox but instinctive finish that he’s shown to go with simpler conversions. It may take a while to click but he also possesses the ability to play delectable combinations in and around the penalty box. Sanchez thrived on those at Barca and with Chile. Watch out for the one-twos between these two. I can also visualize him dropping into a hole just in front of the defence before sliding a ball through with one touch for a player like Oxlade-Chamberlain, or Walcott, or even Debuchy to run onto. The speed at which such understanding develops will determine how effective the youngster is. Giroud can be a good role model for this, at least as far as picking up ideas is concerned. Finishing off gilt-edged opportunities has been a problem for the Gunners in the last two seasons. The England international should do better than the two Frenchmen in converting those chances even though it isn’t one of his big strengths. It could lift the whole team and give the midfielders greater creative desire. There should be 15 League goals for him at the end of the year if he can just take some of the chances that others keep missing far too often. That would be enough for a strong run at 4th place. Arsenal will need 25 or more decisive moments (goals plus assists) from the main striker for having a decent tilt at the title. At the moment I don’t see Welbeck performing at that level but he has the potential to develop into such a productive attacker. The Gunners have added five players to the squad. I think all are quality additions in their own way. Sanchez is absolutely world class. Ospina should, hopefully, take over from Szczesny and give Arsenal a more secure presence in goal. Debuchy is a reasonably good replacement for Sagna. Chambers is an outstanding young talent. And Welbeck has the potential to be a very good striker. It’s strange that so much good work in the transfer market still left me feeling dissatisfied, to put it mildly. And remember, this is from a guy who normally doesn’t grumble about transfers. The general complaint, as far as I understand it, is linked to the lack of a “DM” and central defender. Given that I don’t really think any of the commonly linked players (Carvalho, Khedira, Schneiderlin, et. al.) would have improved Arsenal’s first team, my disappointment is not linked to a failure to sign these players. A central defender was needed. Ideally, I’d have preferred someone who could start ahead of Mertesacker. Most fans would have been glad with a third choice player. It seems, based on various news reports, that Arsenal tried to get someone in but finally chose not to take the decisive step for one reason or another. Depth is a major concern. I’ve always felt Wenger has gone with one or two players less than needed but there is also the issue that Arsenal perform the best when the first eleven is settled and playing together for a long period of time. Some graphs/charts by Behnisch on twitter (highly recommend following him if you’re an Arsenal fan on twitter) are very interesting and informative. Surprisingly, no one really uses all 25 players. It seems 20 very good players should be enough. I’ve read the line, “Only 6 players across 4 defensive positions” quite often. Most other teams have greater depth in these areas but title favourites Chelsea don’t seem to have too many options. Terry, Cahill, Ivanovic, and Azpilicueta are their regular starters. Felipe Luiz is a big money signing but he could turn out to be the next Asier Del Horno. Kurt Zouma is a highly rated young player who has yet to prove himself at this level. And they have a few other youngsters. Can’t say they are too better off in terms of numbers/depth. Manchester United, on the other hand, have quite a few players for defensive positions. But how many of those would you want at Arsenal? Can’t say they are comparable in terms of quality. Don’t get me wrong, I’d love to see more depth. Based on injuries, we might see a backline of Debuchy-Chambers-Monreal-Flamini in some game. Not a heart healthy recipe at all. But I also understand why Arsenal haven’t done any business. There aren’t too many quality players who’d be happy to come to a club as depth boosters. This makes the transfer decision quite complicated. Do you burn a small but not insignificant chunk of your transfer money on an average player to fill one of the squad spots between 15-20 that is likely to see 30-40 percent utilization. Or do you trust the players you have and wait for quality to become available. I don’t think Chambers will have too much trouble covering the minutes of Vermaelen and Jenkinson from last season. Injuries are a valid concern. Then again, the new player could get injured too. Or completely fail to adapt. Here is an exercise you can do – make a list of all central defenders signed by the top 10 Premier League clubs in the last five years. See what percentage of those transfers has worked out. As we’ve discussed repeatedly, defending is a team activity. Individuals matter and having quality players is important, but you can find short term solutions by adapting the way you play. Don’t lose the ball cheaply or give it away when the team shape is compromised and vast majority of difficult defensive actions won’t even be needed. To me, that’s the area Arsenal have failed to address. There are far too many individuals who are losing the ball in the central third. Getting a player who could control the midfield and dictate play was vital. It’s understandable that guys like Kroos or Alonso were never realistic possibilities but there was one ex-player who could have made a big difference. Wenger has made a statement of sorts in choosing to let his son go to crosstown rivals. He is counting on his younger prospects to come good. Wilshere and Oxlade-Chamberlain will really have to step up and deliver big performances in midfield to justify that decision. The other problem areas are more related to coaching/training. Among the top 10/15 clubs across Europe, Arsenal are probably the weakest at pressing the opponents in their half on a consistent basis. Most other teams, even those who normally play defensive, counter-attacking football, have developed the ability to push up and create a period of intense pressure in the opposition half when the need arises. The Gunners couldn’t even keep Leicester pinned deep in their half when pushing for a win late in the game. It’s also the reason a lot of big teams have so much joy against Wenger’s side once they take the lead. The team simply isn’t able to raise the tempo and kick on to overdrive. Signing players is not going to change this. A similar problem is with Arsenal’s inability to form a high-ish defensive block with the first line of defence around the centre of the pitch. Too many teams can bypass this line and get closer to Szczesny’s penalty box. As an extension, the number of transition opportunities that the Gunners can create from such areas is also very limited. Two of Liverpool’s three goals against Spurs came from transitions from the middle third. Most of the goals Arsenal conceded in big defeats last season also came about from such changes in possession. This is another issue that cannot be solved by transfers. These issues are related from a training point of view. The players will continue to lose the ball cheaply in dangerous areas unless they train to keep it against intense, intelligent, and integrated pressing. I’ll try to cover more of this in the Reading the Game series. Speaking of that series, we’re going to India for three weeks and that will probably affect the frequency of articles on the blog. It’s been over five years since we’ve gone back and this will be a very hectic trip. I’m not sure how much time I’ll get to write and publish. If everything goes to plan we should be back by the end of the month. You can keep track of the updates by subscribing through email or through twitter and facebook. All these options are available in the sidebar on the right. It’s always hard to gauge just how a promoted team will play. They sometimes come up with a style that was successful in the Championship and discover that it just doesn’t work in the Premier League. A team that becomes used to winning and topping the table suddenly has to deal with defeats and a scrap at the wrong end. Adjustments have to be made and are not always successful. On the other hand, some promoted teams do really well and produce a fair few surprise results. Often mentioned as favourites for relegation, these sides can hit mid-table heights, even reaching the top half. Leicester came up with an impressive record. Only two teams have been promoted with more points than their tally of a 102 since the formation of the Premier League. Reading managed a whopping 106 points in 2005/06. They followed it up with an impressive effort in the Premiership as they finished 8th. Sunderland clocked 105 in 1998/99 to gain promotion, and they too got into the top half with a 7th place finish the following season in the top flight. Leicester haven’t played enough games for us to judge just where they will finish but they’ve done enough, with a draw against Everton and a narrow defeat at Stamford Bridge, to show they’re not out of place in the big money league. Their style of play doesn’t seem too complicated. Reliance on hard work, organization, discipline, and concentration can pay dividends. They’ve the second lowest possession (37%) and the fourth lowest pass completion rate (74.3%). The season is just two games old but I don’t expect them to change these stats drastically. Arsenal controlling the ball and the hosts trying to control vital spaces in the central areas of their half should be the norm on Sunday. It that sense this game should be similar to the one against Palace, but just a little harder as this is away from home. Arsenal will again have to break a deep seated defence while protecting themselves from transitions and set-pieces. Fast passing, runs in behind, combination play, clinical finishing…I think we’ve covered such topics often enough over the last few years as this is a typical Premier League game against a fighting opponent from the lower half of the table. Defensive issues are well known too. Palace scored with their first shot on target. Everton did the same. Wenger’s side have conceded 3 goals from 5 shots on target in two League games. Gifting opponents goal scoring opportunities has long been the bane of Arsenal. Leicester have some pace and trickery on the wings and play with two forwards who possess useful physical qualities, so they can be a threat on counter-attacks, from long balls, and set-pieces. Absolutely nothing new. It’s going to boil down to number of mistakes made and the degree of luck Arsenal have. Szczesny – Debuchy, Mertesacker, Koscielny, Monreal – Flamini, Özil, Ramsey – Wilshere, Alexis, AOC. Wilshere produced some interesting performances when he played on the right flank last season. He can be more influential when cutting in because the body shape and angle would help him pick a wider range of passes. Such a role would also keep him closer to the dangerous attacking areas with fewer defensive responsibilities. Özil back in his best role obviously helps the team. Oxlade-Chamberlain should have more shooting opportunities when cutting in from the left onto his right foot. He also has a decent enough left foot to go on the outside and deliver balls into the box. Sanchez could move into the wider areas on the right when Wilshere cuts in and he can constantly look to get in behind with two or three players in good positions to pick passes. It seems to me this system can get the best out of a lot of players. That said, I won’t be surprised if Wenger stays with Wilshere and Ramsey in the middle, particularly if he sees that as a combination for the long term that needs to be given time to gel. This would most probably put Özil back on the left. It might be worthwhile swapping the German and AOC even if Wenger wants to play Jack and Aaron through the centre. Arsenal have been playing every three days and rotating players can help. Chambers for one of the defenders and Rosicky for one of the midfielders are definitely worth considering. Last season Arsenal had a very good away record against teams in the bottom half as they picked up 28 points out of a possible 30. The only draw came away to West Brom relatively early in the season. Gaining points in the big games will only matter if the Gunners can replicate this dominance over the weaker sides. Anything less than three points will be a significant setback. This was another tough outing for the below par Gunners who are still searching for some fluidity and understanding between the midfielders who are central to all of Arsenal’s play. The first half had few chances but was generally marked by low quality football. Opportunities arose from bad mistakes and they were squandered by misfiring attackers. For example, Wilshere and Cazorla both got a great sight of the Besiktas goal from cheap giveaways by the opponents but neither came close to hitting the target. At the other end, Pektemek could have been clean through in the first minute but chose to play the ball back to Demba Ba. Counter-attacking chances were continually missed by both teams throughout the game. It also seemed like Lady Luck had taken to the Suave Frenchman in charge of the home side over his more rugged counterpart sitting in the stands. There were two big controversial penalty calls in the first half that went in favour of the Gunners. My initial feeling was that Debuchy got the ball and that Wilshere had just done enough to avoid contact. Replays at half time seemed to show the French full-back missing the ball and later I read Wilshere acknowledging that he’d touched the opponent. With the benefit of hindsight and slow motion replays, I think it’s safe to say the Gunners got away with two penalty decisions, one of which could easily have been a second booking. In the recent past, although not in the last couple of seasons, Arsenal used to suffer a lot at the hands of the referee, so I can certainly empathize with the frustrations of the supporters of the Turkish side. Qualifying for the Champions League proper could have been a really big step for them. Wenger’s side did get some sort of rhythm towards the end of the first period and scored a nice team goal. Debuchy’s initial run was well-timed and his cross, while hopeful, was difficult to clear. Monreal’s positioning in the box was ambitious and his calmness in winning the header to direct the ball to Wilshere was appreciable. Jack played a decent one-two with Özil before Sanchez slotted the ball home. The goalkeeper should probably have done better but he might have been caught off-guard while expecting the Englishman to strike the ball. The second half started where the first had ended with the Gunners in control. Wilshere gladly received a loose clearance in the box and set up Sanchez. The Chilean’s shot, or was it a square pass, was cleared for a corner. The Gunners had numerous other chances to score, mostly on quick breaks. Özil, Sanchez, Cazorla, and Oxlade-Chamberlain could all have done better to make the game more comfortable for the home side. Debuchy and Koscielny also had the chance to double the lead from a well-struck free-kick. Slowly, around the hour mark, the game started becoming very vertical. Arsenal didn’t have as much control of the midfield and the visitors were looking threatening. And the direction of attacks swung completely once Debuchy was sent off. It seemed like a very harsh decision even if the referee called it for some pushing before the actual ball-winning tackle, which didn’t seem like a foul at all. I wonder whether the referee was influenced by his mistakes in the first period and saw this as a way to make amends. From that point on the Portuguese official completely lost the grip on the game (not that he was impeccable before). The final 15 minutes were extremely tense. While the visitors didn’t muster a single shot on target and only three off target in the whole game (four blocked), Wenger’s side were defending so deep that any momentary lapse in concentration, or individual quality, could have proved extremely costly. Don’t forget that Arsenal had conceded from the first shot on target in both their League games. This time around the numbers in the box were enough. Top notch focus and determination helped. When one player made a mistake a teammate was there to knock the ball away from danger. I also felt Besiktas should have thrown a few more bodies into the box. The bottom line is that Arsenal are through. Besiktas deserved more and these are the games where I feel both teams should progress. There is no doubt the Turkish side are better than many of the clubs who’ve made it to the group phase. Good luck to them in the Europa League and the domestic competitions. Wenger’s side clearly have a lot of room for improvement. Mertesacker touched upon the crux of the problem. That’s still a tough challenge for us – to get ourselves going, to find our passing game. We’ve only trained two or three times together and this season makes it really difficult for us to stick to our game. We have to find ourselves still. Arsenal’s spirit and mental qualities have been exceptional. But these eventually break down if the team has to produce backs-to-wall performances week in, week out. Hopefully, the manager will be able to work his magic before it’s too late. On a side note, it’s worth noting that big, strong defensive midfielder Atiba Hutchinson wasn’t really able to “destroy” many of Arsenal’s counter-attacks. The attacks broke down for different reasons illustrating how percentages work in favour of the defensive side. It’s also interesting that Wenger praised the Canadian’s display after the game, and deservedly so because he did a lot of things well. Most of Arsenal’s counter-attacks were not his fault and there wasn’t much he could have done to break them up. Szczesny: Incredibly, for such a tense game, the Pole had a relatively comfortable time in goal as the visitors failed to hit the target. Didn’t have to deal with one-v-ones or many crosses either. His handling of the ball was efficient and error free. Debuchy: Made a number of very exciting forward runs. Also made a few useful interventions in the penalty box. Showed good understanding with AOC. I thought his first foul was really unnecessary and rash. Was lucky and then unlucky, as discussed above. Mertesacker: His error in judging the flight of the ball led to the first penalty situation. Another ball flew over his head late in the second half and Demba Ba could have scored with better contact. Wasn’t really beaten in other individual duels but I’d hoped he would bring greater composure to the team’s play, particularly in the second half. Koscielny: Played Pektemek onside in the first minute and was caught a bit flat-footed when Mertesacker missed his header. Apart from that I thought he had a good game. Was alert in the box and almost scored at the other end. Monreal: This was arguably the Spaniards best game in an Arsenal shirt, at least from a defensive standpoint. Created a great chance for Oxlade-Chamberlain and contributed to the decisive goal but we do expect good attacking quality from the former Malaga man. I really liked his defensive work – concentration, attacking the ball, positioning, etc. Was helped by decent support and didn’t have to deal with quick, tricky players running at him, but more of such efforts will considerably help the team’s cause in the long run. The defensive players made some mistakes and rode their luck a bit. The two on the right side could certainly have done better. Flamini: The physicality and broken nature of football meant that this was his kind of a game. Passing was efficient even if not as prolific as the position demands. Lots of tackles all over the pitch and very useful presence in and around the box. 1) Losing the ball cheaply – He lost the ball cheaply in the first minute through an attempted outside of the boot pass. This led to the first threatening counter-attack. Did something very similar again in the 11th minute and play was broken by a foul by Mertesacker. Even the pass for the one-two before the goal was a soft touch and only the alertness of Özil kept the move alive. His ideas are good but the execution isn’t always up to scratch. 2) Decision making – Remember the counter-attack when he picked up the ball around the centre line and had three runners in front. And early ball for Oxlade-Chamberlain would have been much better. Instead he ran with it for 25-30 yards before finding Sanchez with a pass at a very awkward height. In such cases you see his thinking needs to sharpen up. These are never easy choices but the truly top players make them a lot more consistently. 3) Tackling – Absolutely must stop lunging at opponents, it’s a disaster waiting to happen. It’s related, at least partly, to being slow to read the danger and thus having to catch up and cover greater distances which his lack of speed doesn’t allow. The solution is to develop defensive intelligence. He’s working on it – I see him looking around a lot more when the team is defending – but still has a long way to go. 4) Technique – Some of his touches and passes are exquisite. But he needs much better quality and consistency on the outside of the boot pass if he cannot develop his right foot. In that attack discussed in 2 above, I cannot imagine him finding Özil on the left with his current technique. The only way he would be successful is by completely opening up his body, which would then telegraph the pass to defenders. Hard to see him scoring with his right if Sanchez hadn’t taken over. His desire and physical effort were excellent throughout the game. Technique, awareness of space, and tactical play was also really enjoyable. But it’s one thing to appear heroic and dominant in a hard-fought qualifier against Besiktas and quite another to be the fulcrum of an Arsenal side that wants to dominate major Champions League and Premier League games. Cazorla: A close second for the MotM in my opinion. He’s not had a great start to the season but the effort in this game was much better. Defensive work when the team was down to 10 was outstanding. Still needs to protect the ball better in physical games. Özil: Not a game he’d want to remember. Missed quite a few chances to put Sanchez in behind. Didn’t seem to be on the same page as his teammates at times. Did put in a lot of running up and down the pitch, often thanklessly. AOC: Good understanding with Debuchy, made some powerful runs early on, picked a nice cross-field pass for Cazorla, and I liked the way he dropped deep at times to let Debuchy or Sachez use the space on the right. Should really have done much better from that chance just before the red card. The midfielders faced a tough physical battle. They were good in patches but didn’t combine as well as they can. Individually, they all had room to do better. Appreciable hard work at the end. Sanchez: My MotM. Extraordinary work rate, produced the decisive moment, constant clever movement, never gave up. Will still get much better as the team dynamic evolves but this game showed the first signs of what he can offer even when played as a central striker. Could have done better with a couple of chances but don’t forget it’s the hardest thing to do. Subs: Chambers was unlucky to be booked and didn’t have too much to do. I thought Rosicky for Özil around the hour mark might have helped the team quite a bit. Wenger: Achieved a major target and hopefully that will liberate him a bit more in the transfer market too. Team dynamic is still a work in progress. Relying on Sanchez as a centre forward could be a masterstroke or a disastrous decision. I’d prefer it if he didn’t take the gamble, but is there a top quality alternative available? The second leg of the Champions League qualifier could be Arsenal’s biggest game of the season. Barring the case of winning either the Premier League or the Champions League, both in the realm of possibility but not the most likely of events, the huge financial boost received from entering the group phase of Europe’s elite competition could be the Gunners’ most valuable achievement this season. That income as well as the knowledge of Champions League involvement might also affect some business that Wenger might be able to do before the transfer window closes. Bilic knows all the pressure is on Arsenal. His side have nothing to lose. This could liberate them to play as aggressively as they did in Turkey last week. The intensity of their play will be the key to their chances. Arsenal have quite a few players missing and the visitors will want to make it hard for the hosts to establish their style of play. Sitting back and inviting pressure would be counter-productive for them. Pushing up and chasing every ball would be the best approach. Try and force mistakes in the middle of the pitch, and utilize the individual qualities they have in their attacking players who can dribble, run, combine, and finish, particularly when they have space in the attacking areas. In the Croat’s boots, I’d want my team to try and isolate the wingers against the Arsenal full-backs or Demba Ba against/behind the central defenders. The performances of some of the German teams at the Emirates should provide the template. They do need to be careful with the physical play and ensure their players don’t pick up early bookings. Avoiding errors seems like a very obvious thing to do but is often not that easy when the game is played at a frantic pace. Wenger has to do the opposite. He has to preach control. Arsenal have, in the recent past, dismantled a couple of Italian teams by playing at a very high tempo. I’m not convinced the players at the manager’s disposal, given the limited understanding they have at the moment, can reproduce that tempo. This means a vertical battle could be detrimental to the home side’s cause. They don’t want to leave a slow-ish defence exposed with big gaps between the lines. Arsenal have to establish midfield superiority and push the opponents back. Besiktas are a good side but they aren’t exactly experts at parking the bus. As we saw in the first leg, if the Gunners get to the attacking third they will see some openings. Of course, the finishing and the final ball will have to be much better. With Arteta and Giroud injured and Ramsey suspended, the choices for the starting line-up are somewhat limited. Playing the German twice in a short period would be a risk but it’s one that I think Wenger will take. That’s not exactly the strongest midfield but I can’t think of a better combination based on availability. Özil and Cazorla have to take extra responsibility and make sure they don’t lose the ball carelessly. Sanchez as a striker didn’t quite work in the game against Everton but he should surely get more time there. At the moment, I’d go with the Chilean if Sanogo is the only other realistic option. Changes can always be made at half time. Then again, that argument works for starting the French youngster too. Rosicky hasn’t seen much game time and that has been a surprise. I don’t know what to expect. Campbell is another player who will be hoping for a better chance to show what he can do. Will this be the game? Doubtful. Is Koscielny injured? I didn’t see him in the training pictures on the Arsenal website. From the players available, the individuals in the line-up above have played the most minutes. It’d seem best to go with these guys and expect them to show better understanding in the attacking areas. Arsenal will have a very good chance of qualifying as long as they can keep the goal protected. Set-pieces have been a problem area and the team have been troubled by pace. Space on the right side was a problem area against Everton and in the first leg of this tie. Sorting those issues out could prove vital in the first must-win game of the season. Often it’s difficult to judge if a team seems dominant because they’re playing well or due to the weaknesses of the opponent. But unless you can determine the dynamic that is driving the patterns on the pitch, any analytical process will return a flawed output at best. I was expecting a low to average quality game between two sides that are yet to hit their stride and that’s what we saw. For most of the game, and particularly in the first half, it appeared that the hosts were playing well but they will really have to up their game if they want to have any realistic hopes of challenging for the Champions League spots. Their combination play was extremely limited and very little came down their right side. See the following comparison of their attacking third passes with the corresponding fixture from last season. Notice the density of the smaller lines that represent short passes which are an indication of combination play. They weren’t able to bring Lukaku, Naismith, or Coleman into the game as often as they did in April. The two strikers received about two-thirds of the passes they did in the previous game. Naismith was involved in a lot of short passing when the Toffees won but this time he seemed more a target for vertical balls in a limited role. He had almost no involvement on their right flank. Coleman rarely saw the ball in the attacking third in this game as against his very influential attacking contribution from the last one. The impact of this can be seen from the quantity and quality of chances they created. The Toffees managed a number of shots from central areas and inside the box when they won but in this game they created fewer chance and nothing of note except the three big ones mentioned above. They also completely faded away in the second half. It was similar to their drop in performance against Leicester. Comparison with last season’s game illustrates this further. Recall that we’d talked about controlling the ball as one of the key aspects of defending. 113 passes out of 158 is something one would expect from a mid-table side. Wenger’s choices for the starting line-up were somewhat surprising. I understand that some fans have been hoping for more pace in the side, particularly with the inclusion of Oxlade-Chamberlain. Alexis as the central striker is also a choice many wanted to see. In theory, the Gunners could have produced some very fluent football with six players capable of playing the pass-and-move game. In practice, Arsenal were rudderless and failed to create much, despite the opponents lacking some of their usual defensive qualities. Wenger’s side managed five shots in the first half. All were taken by Oxlade-Chamberlain. All were off target. Sanchez was not on the same wavelength as his teammates, was often isolated, and never saw the ball in actually dangerous areas. It seemed like he was too mobile for his own and the team’s good. Giroud’s arrival made a big difference. He became an excellent focal point for the team. 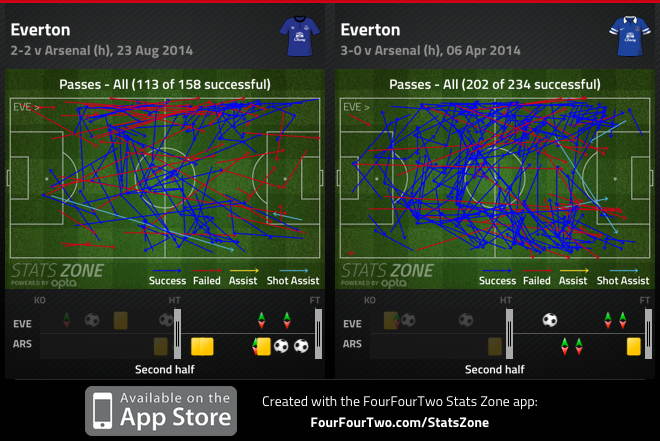 But we must also note that Everton really dropped in quality in the second half. Giroud played most of the game there in April and wasn’t half as influential. So it wasn’t just about the Frenchman’s physical presence or other qualities, it was a combination of things, chief among which was the hosts’ poor performance. This culminated in absolutely abysmal defending for the goals, particularly the first one. Arsenal were not really tested in defence, except for many balls played down their right flank. Chambers or Debuchy got around to dealing with most of these. But if you keep leaving that space open, sooner or later the opponent will capitalize. Arsenal conceded their first goal from a well-worked set-piece. While the hosts deserve credit for the clever use of space and ball, it’s hard to keep track of the number of mistakes Wenger’s side made. Arsenal have 7 players in the defensive line against 3 attackers. Even then Naismith is sort of free. Oxlade-Chamberlain is in a pointless position. Everton have two players free wide on the left and acres of space. AOC could easily have been near Osman with Ramsey a little higher and central. I don’t really understand what the thinking was here. Alexis is the sole guy chasing the ball. This is a classic example of what I’ve called “Crowd the centre” tactics from Arsenal. Get enough bodies in central areas in front of goal and it’ll be very hard for opponents to score. Once Barry plays the ball wide, we see Debuchy and Oxlade-Chamberlain moving towards the right flank. They’re too late and have little chance of making a difference if Everton played quick passes (which they obviously did). It’s interesting that Sanchez is in front of Barry but he is also caught ball watching and doesn’t notice the Englishman sneaking past him into the space on the edge of the box. The Gunners went deeper into the box when the ball went wide and then tried to push up when it was passed to the assist provider. Chambers was not able to push up in time but this probably would not have mattered because Coleman was anyway onside. Özil made the obvious mistake of not tracking the run of the full-back. But I simply don’t see the point of giving one of your key attacking players such a role. If anyone in this team can be excused for not having enough defensive awareness, it’s Özil. Note that I’m not condoning the error, just saying that it was the most understandable one and should be avoided by altering the roles. Szczesny was in a bad position because once again his first instinct was to go towards the ball. The forward steps that he takes eat up valuable time. This meant he wasn’t in position or well balanced when the header was struck, and that in turn meant he was late in getting his arms up. The above snapshot was taken when the ball was already halfway towards him after the header by Coleman. 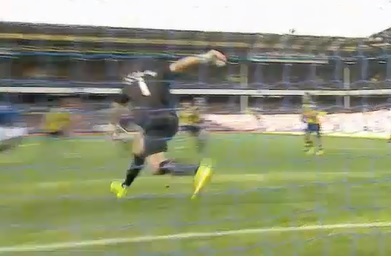 Szczesny is still in the process of moving to his left and his arms are just trying to provide balance to that motion. By the time he gets that left foot down and tries to move his arms up it’s too late. This was a header I’d expect a good goalkeeper to save. The Pole made a very similar mistake against Southampton last season when he conceded at the back post. Everton’s second goal came from a brisk counter-attack. There is genuine reason to blame the referee for this one. Even if the foul on Mertesacker is considered debatable, there was no question about the off-side and the assistant was well placed to make the decision. That said, there are a few aspects worth noting and areas where Arsenal will have to improve. Lukaku did not track Monreal. Everton left him higher up the pitch (along with Naismith and Mirallas to an extent) and made sure they defend well with seven players. You don’t want to see your best attacking players forced to track back all the time. This is something Arsenal have to learn to do. Chambers made a very rash decision to dive in. Had he stayed on his feet and slowed Lukaku by showing him out wide, the sprint back by Özil could have resulted in an extra body enough to limit the threat. Flamini, the destroyer, wasn’t able to break play up. Far too many people simply assume a tough tackling player will prevent counter-attacks. It just doesn’t work that way. Szczesny conceded through his legs. It was just awful. I remember a lot of such goals scored a decade or so ago when many one-v-one situations led to goals between the Keeper’s legs. It shouldn’t happen in the modern game. The opponent should be forced to beat the goalkeeper over one of his legs. This is important because if the ball goes between the legs it’s guaranteed to go in goal. But if you tuck one knee in and close that gap, chances are the opponent will either hit your knee or can miss the target when going for the corners. Again, Arsenal’s current first choice goalie has previous with such errors. It’s just very bad goalkeeping. Arsenal’s first goal came out of nothing. Everton had 7 players in and around the box but they just all went to sleep. No one went to close Cazorla down and Ramsey’s run wasn’t tracked. Osman, Baines, and Coleman could all have done better. Very poor defending. Cazorla’s composure and accuracy of pass should be appreciated. Ramsey’s ability to keep going and his instincts in the attacking area are also worth commending. When you have a big striker you expect him to score some really physical goals. Bully the defender and just knock the ball in. The Frenchman doesn’t do this often enough but in this case it was perfect execution. Monreal’s cross was well directed too. Nonetheless, any manager would be disappointed if his team conceded such a goal. On the whole, I felt the hosts were well below their best all over the pitch. It’s also the reason this game seemed like one that Arsenal should have won. The title race is long and ruthless. There will be enough games that are really tough and a few where luck simply won’t go Arsenal’s way. This wasn’t one of them. Dropping points in such games, irrespective of what happened here last season or what will happen to other teams on this ground once the Toffees rediscover their mojo, is something the Gunners can ill-afford. Based on his decisions this summer and thus far in the season, I have a feeling Wenger has taken a big gamble on the young British talent at his disposal. And if this game is anything to go by, Wilshere and AOC are a long way from deserving starting spots in an Arsenal side that wants to contend for the major titles. Both possess a fair amount of individual qualities and potential but lack the ability to make the right choices that’d make the whole team better. Szczesny: Terrible (as discussed above). Debuchy: A lot of attacks came down his flank and at times he was a little higher up the pitch than necessary. There were also times when he was caught in a situation where Mirallas was moving in while Baines was running down the flank without being tracked. The Frenchman made the right choices for the most part and that limited the number of chances that could be created from that flank. Didn’t get on the ball often enough for my liking and understanding with AOC or Sanchez could have been better. Chambers: Had to cover behind Debuchy quite often and he did that well. Passing was quite composed. I really like the way he stayed with Lukaku when the striker ran across the face of the box after Mertesacker slipped and fell while trying a back pass. Bad choice to dive in as discussed above. Also has trouble with balls played behind him. 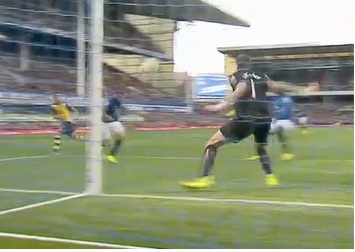 For instance, when Naismith headed that ball in behind, the youngster turned 270 degrees from his right to face his own goal and chase instead of a simple 90 degrees to his left. That suggested he lost his bearings for a bit. In defence, that can be the difference between a clean tackle and a foul or even a goal. Mertesacker: Had a tough time when isolated one-v-one but that happened rarely. Not sure if he was supposed to be organizing the team for the set-piece. There was less action on his side of the pitch. Monreal: Was more involved on the ball than his teammate on the other flank but had significantly less work from a defensive point of view. I was surprised the hosts didn’t try to isolate his against Lukaku or Coleman. Good assist. The defenders had a few tough moments to deal with and they did alright for the most part by limiting spaces to the wider areas and quickly covering for each other when the ball reached the final third. As a result the goal wasn’t exposed as often. The second goal should have been ruled out but the team needs to learn it’s lessons. Set-piece defending was again poor but it’s not just limited to the back four. The whole team and the coaching staff have to take responsibility. Flamini: Passing was reliable but he should have been a lot more involved in ball circulation. That’s one of his major weaknesses. His tough tackling style wasn’t really useful as he made just two tackles. Five fouls, while not in the Chamakh category, is still a bit too much. As the deepest midfielder in the 4-1-4-1 of the first half, he wasn’t quite sure whether to stay with Naismith dropping deep or to cover the right side. Ramsey: Tough game, wasn’t able to influence the attack or help with the defence nearly as much as he can. Came up with a big goal. Wilshere: This was another game where he didn’t make any obvious mistakes but just couldn’t help make the team better. Needs much faster speed of thought if he has to play in the centre with a guy like Özil on the flank. Completed 1 of his 5 attempted take-ons. Will be much better if he starts using his passing array a lot more and limits the whole “driving at opponents” bit to a few carefully chosen moments. Özil: Stuck on the left and just his first game of the season yet seemed like the best player on the pitch. Error for the goal aside, it’s hard to find any faults with his performance. Played a lovely through-ball for Wilshere, set-up AOC with a good cut-back, another chance for Chamberlain came when one of his through-balls for Monreal forced a panicky clearance from Coleman, and many other small moments of quality all over the pitch. Deserved better support and intelligence from his teammates. Oxlade-Chamberlain: Somewhat wayward and wasteful with shooting. Ran into crowds quite often. Created a good chance for Giroud early in the second half. Was lax with tracking Baines. Disappointing performance on the whole. Cazorla: Had only a few minutes on the pitch. I liked his professionalism and focus. Excellent weight on the pass for Ramsey. The midfield was all over the place in the first half. The movement itself was decent but understanding and speed of passing was not up to scratch which constrained the quality of attacks they could build. Promising moments in the final third were squandered by poor choices or execution. Defensive support was good. Covered the central areas well, except one or two cases. Sanchez: Had only one touch in the opposition box. Wasn’t on the same wavelength as anyone else. Wenger talks about physical fitness but to me it seems more a case of role definition. He’s another player who’s trying too hard and needs to simplify things. Let others do bulk of the work and focus on getting into the vital attacking areas. I did enjoy the time he tracked Mirallas all the way back to prevent a counter-attack after losing the ball through a bad touch. Giroud: Looked hungry and got into very good areas. On another day he could have scored more. That goal against City and this one show the kind of qualities he has. But there have been a few false starts so I’m waiting to see if these can be replicated. News of his injury, if true, is disheartening. Campbell: Only had a few touches, overhit a couple of passes, just good to see him get his Arsenal debut. Wenger: Still searching for his best eleven. Has clearly put faith in some of the younger players and his reputation could be at stake more than ever before because big players have been available and Arsenal have fewer financial restraints. In many ways, this season is going to be a bigger test for Roberto Martinez than last year. He did well in taking Everton to 72 points, their highest tally during the Premier League era. But now he has to show he can do it again or even better it. This won’t be easy because a lot of other teams now know how his side play and will be better prepared. Speaking of being better prepared, we’ll have to see just how well Wenger has readied his side. While Arsenal had three very different results against the Toffees last season, they were all very tough encounters. In their win in the corresponding fixture last year, Everton found a lot of joy down their left flank and capitalized on numerous errors by the Arsenal midfield and defence. Baines and Pienaar have developed a very good understanding, while others who sometimes play there, like Mirallas, also combine well. The movements of their striker and the player on the right synchronizes well with attacks building down the left. Given that Debuchy has been taking up very aggressive positions, this area could again be the key attacking zone for the hosts. Arsenal will have to keep it in control by – 1) Debuchy picking his moments carefully, 2) Central defender on the right side being more aware to the threat, 3) One of the midfielders scooting over to provide cover consistently. Not losing the ball carelessly in the first place, and avoiding half-hearted pressing in the Everton half will also make a big difference. Lukaku against Monreal could be another difficult battle from an Arsenal perspective. Some people might prefer to see the Belgian centrally but given his obvious advantage against the full back, it’ll be very strange if Martinez indeed made that choice. If he does, I’d expect Lukaku to drift into the channel and towards the left. Otherwise he’ll look to cut across from the left and bend his runs before going in behind. During the course of the game I expect both of the wide players that Wenger picks will have to put in some defensive tracking. Any laxity there could make life for the defensive players much tougher. The battle in the centre of midfield will also be very interesting. Without Arteta, the Gunners could struggle with the build-up play if pressed diligently and coherently. This could lead to very threatening transitions. On the other hand, Everton have had a winless preseason and were held to a draw by Leicester on the opening day. So far their players haven’t quite found the groove again. The Gunners have a chance to capitalize on their rustiness. Since Arsenal aren’t quite firing on all cylinders either, this could be a relatively low quality game decided by mistakes. 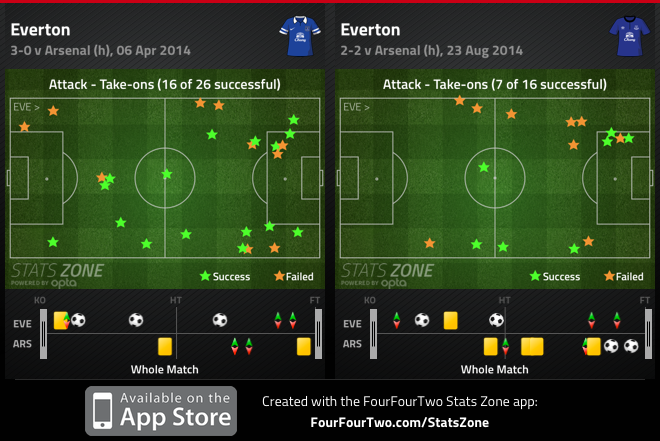 When in form, the Toffees defended the central areas very well. Barry and McCarthy formed a very effective central midfield partnership even though neither is physically imposing or fast. Direct passes into the central areas could be ineffective and the Gunners might have to work their way into the threatening zones by combining in the wider areas. Leicester got some joy on set-pieces and Stones wasn’t always in a good position at right back. I wonder if Coleman will be brought back to the right back spot for this game. Irrespective of who starts or the hosts, getting a chance to run at either of their full backs in a one-v-one could lead to very promising moments in attack for the visitors. Patience could be a handy virtue and the first goal could be absolutely vital again. Arsenal scored first in 24 out of their 38 games and recorded league best 2.79 PPG in these fixtures. They conceded first in 12 ties and only managed 0.83 PPG. The corresponding PPG numbers for Everton are 2.63 from 22 leads and 0.83 from 12 leads conceded. While the Gunners did turn the game around against Crystal Palace, I don’t think it’d be wise to expect too many such reversals. Wenger has a few options in team selection with the return of the Germans. However, I’d be very surprised if he started any of them because they haven’t had any match practice (Not sure if any behind the doors friendlies have been arranged, but even those have limited utility). He’ll have to substitute them around the hour mark if the Germans start or he risks overextending them right at the start of the season. While there is always a chance that he could take a gamble and get away with it, I’m not sure it would be a clever choice. Of the three, if really needed, Mertesacker could be the one to start because central defence requires less physical intensity than a role that Özil would play. Anyway, it’s hard to judge because each player could have different preparation levels. In midfield, Flamini for Arteta seems like the safest option. Some might suggest Chambers, given the current wave of hype, but I would find such a choice extremely risky. Passing the ball when there is limited pressure at the back is one thing, playing in midfield when there is constantly someone snapping at your heals quite another. It would be best to try him in that role in one of the relatively easier home games where the opponent is more likely to sit back. Cazorla hasn’t produced the output we know he can so a strong argument exists for dropping him from the side. At the same time, Ramsey and Wilshere in central midfield don’t really make the team performance better. I’d be tempted to leave Wilshere out and bring Cazorla into the attacking midfield role while switching Ramsey to the left of centre and Flamini to right to cover behind Debuchy. However, since the manager believes so strongly in the young Englishman, and has talked about his performance improving with a run of games, it’s very unlikely that Wilshere will be left out. Chamberlain for Cazorla would be a popular change. If Chamberlain plays on the right, it’ll be interesting to see his understanding with Debuchy. The best solution would be for the full back to stay deeper for majority of the game and let the youngster hug the touch line. Things could get complicated if both start getting into the same areas out wide. Szczesny – Debuchy, Mertesacker, Koscielny, Monreal – Flamini, Ramsey, Wilshere – AOC, Giroud, Alexis. Chambers might start ahead of Mertesacker if the German is not ready. Alexis through the middle and Chamberlain for Giroud is another option. I’m sure some fans will also like to see Campbell get a start. These don’t seem like the kind of choices Wenger would make though. It’s hard to predict the result between two teams that are still some ways away from their best. Everton could have a slight edge because they didn’t play in the middle of the week and are at home. Arsenal have a chance to show they can do better than last season.